The Douglas D-558-2 Skyrocket on display outside of the Lockheed Martin IMAX® Theater at the National Mall building. Piloted by A. Scott Crossfield, on November 20, 1953, the Douglas D-558-2 Skyrocket became the first aircraft to fly faster than Mach 2, twice the speed of sound. Air-launched from a U.S. Navy Boeing P2B-1S (B-29) the swept-wing, rocket-powered D-558-2 reached Mach 2.005 in a shallow dive at 18,898 meters (62,000 feet). Piloted by A. Scott Crossfield, on November 20, 1953, the Douglas D-558-2 Skyrocket became the first aircraft to fly faster than Mach 2, twice the speed of sound. Air-launched from a U.S. Navy Boeing P2B-1S (B-29) the swept-wing, rocket-powered D-558-2 reached Mach 2.005 in a shallow dive at 18,898 meters (62,000 feet). Highlighted in this images is the pitot tubeof the Douglas D-558-2. Piloted by A. Scott Crossfield, on November 20, 1953, the Douglas D-558-2 Skyrocket became the first aircraft to fly faster than Mach 2, twice the speed of sound. Air-launched from a U.S. Navy Boeing P2B-1S (B-29) the swept-wing, rocket-powered D-558-2 reached Mach 2.005 in a shallow dive at 18,898 meters (62,000 feet). Highlighted in this images is the cockpit of the Douglas D-558-2. Piloted by A. Scott Crossfield, on November 20, 1953, the Douglas D-558-2 Skyrocket became the first aircraft to fly faster than Mach 2, twice the speed of sound. Air-launched from a U.S. Navy Boeing P2B-1S (B-29) the swept-wing, rocket-powered D-558-2 reached Mach 2.005 in a shallow dive at 18,898 meters (62,000 feet). Highlighted in this images is the horizontal stabilizer and vertical stabilizer of the Douglas D-558-2. Piloted by A. Scott Crossfield, on November 20, 1953, the Douglas D-558-2 Skyrocket became the first aircraft to fly faster than Mach 2, twice the speed of sound. Air-launched from a U.S. Navy Boeing P2B-1S (B-29) the swept-wing, rocket-powered D-558-2 reached Mach 2.005 in a shallow dive at 18,898 meters (62,000 feet). Highlighted in this images is the engine exhaust of the Douglas D-558-2. Piloted by A. Scott Crossfield, on November 20, 1953, the Douglas D-558-2 Skyrocket became the first aircraft to fly faster than Mach 2, twice the speed of sound. Air-launched from a U.S. Navy Boeing P2B-1S (B-29) the swept-wing, rocket-powered D-558-2 reached Mach 2.005 in a shallow dive at 18,898 meters (62,000 feet). Highlighted in this images is the wing and fuselage of the Douglas D-558-2. The Douglas D-558-2 Skyrocket became the first aircraft to fly faster than Mach 2, twice the speed of sound. The D-558 series of aircraft was developed by Douglas under the direction of Edward H. Heinemann for the U.S. Navy to explore transonic and supersonic flight. This object is on display in the Concourse - 2nd Floor at the National Air and Space Museum in Washington, DC. The D-558 series of aircraft was developed by Douglas under the direction of Edward H. Heinemann for the U.S. Navy to explore transonic and supersonic flight. 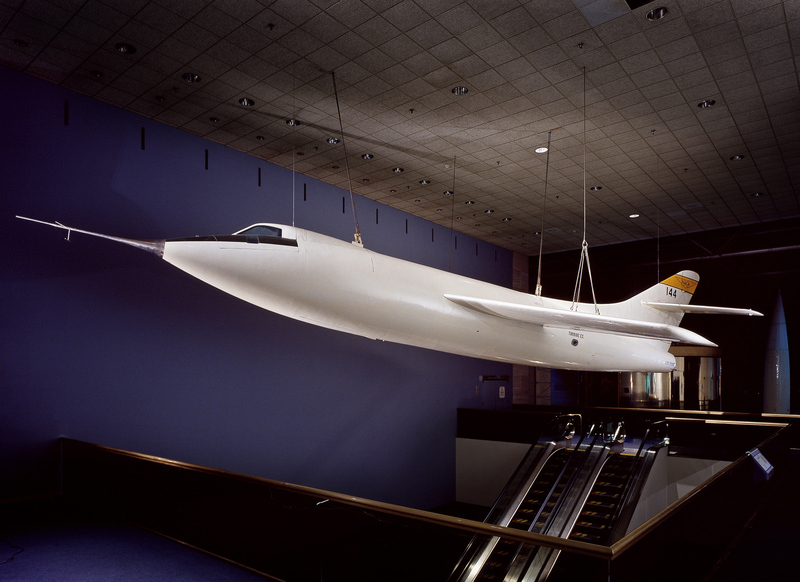 The National Advisory Committee for Aeronautics (NACA, the predecessor to NASA), used this Skyrocket, the second one built, to explore the flight characteristics of swept-wing aircraft. It set several other speed and altitude records before the program ended in 1956. On the morning of November 20, 1953, A. Scott Crossfield became the first pilot to fly at twice the speed of sound, Mach 2. He accomplished this feat while flying the experimental air-launched rocket-propelled Douglas D-558-2 #2 Skyrocket. This sweptwing research plane attained Mach 2.005 (1,291 mph) while in a shallow dive at an altitude of 62,000 feet. Seconds afterward, the plane's XLR-8 rocket engine exhausted its fuel supply and shut down. Crossfield glided earthward to a smooth dead-stick landing on Muroc Dry Lake, at Edwards Air Force Base, California. The D-558-2 #2 was just one of six different D558 research airplanes ordered by the U.S. Navy from the Douglas Aircraft Company for obtaining aerodynamic information at transonic and supersonic speeds. The Navy issued a letter of intent to Douglas on June 22, 1945, for construction of six Model D-558 aircraft, having straight, thin wing and tail surfaces, and turbojet propulsion. Development of the aircraft began under the direction of chief engineer Edward H. Heinemann. Subsequent analysis of captured data on wartime German sweptwing research, combined with sweptwing studies by American scientist Robert T. Jones, caused Douglas and the Navy to modify the D-558 contract by deleting three of the planned aircraft and replacing them with three sweptwing vehicles powered by both tu4bojet and rocket engines. The first three aircraft, each powered by a single General Electric TG-180 turbojet, became known as the D-558-1 Skystreak series. The last three, powered initially by a Westinghouse J-34 turbojet for low-speed flight plus a Reaction Motors, XLR-8 rocket engine for high-speed research, became known as the D558-2 Skyrocket series. research program by the National Advisory Committee for Aeronautics (NACA). The first D-558-1 Skystreak, bureau number 37970, completed its maiden flight on April 14, 1947, piloted by Eugene F. May. On August 20, 1947, Navy Cmdr. Turner F. CaIdwell set a new world air-speed record of 640.663 mph while flying the D-558-1 #1. Five days later, on August 20,. 1947, Marine Corps Maj. Marion Carl, while flying the second D-558-1, bureau number 37971 (NACA 141), broke CaIdwells record by reaching 650.796 mph. The NACA utilized the third D-558-1, bureau number 37972 (NACA 142), for extensive investigations of transonic aerodynamic phenomena and aircraft behavior, retiring this Skystreak in 1953. The D-558-1 #1 did exceed Mach 1 on September 29, 1948, while piloted by Eugene F. May and flown in a 35-degree dive. One Skystreak, the D-558-1 #2, crashed on May 3, 1948 during a takeoff accident following engine failure, killing Howard C. Lilly, a NACA research pilot. The first D-558-2 Skyrocket, bureau number 37973 (NACA 143), completed its initial flight on February 4,1948, piloted by John F. Martin. The second Skyrocket, bureau number 37974 (NACA 144), went to the NACA, which used it to investigate the behavior characteristics of sweptwings. During this program, before its conversion to all-rocket propulsion, the D-558-2 #2 revealed the tendency of sweptwing aircraft to pitch up under certain aerodynamic conditions. After modification in 1950 to all-rocket configuration, the D-558-2 #2 attained Mach 1 .88 and an unofficial altitude record of 79,494 feet. while flown by Douglas test pilot William B. Bridgeman. Following delivery to the NACA, this Skyrocket extended its unofficial record altitude to 83,235 feet, while flown by Marine test pilot Marion Carl on August 21, 1953. Shortly afterward, NACA research pilot A. Scott Crossfield exceeded Mach 2 in the plane. The NACA utilized the third D-558-2, bureau number 37975 (NACA 145), in a program evaluating the effectiveness of wing slats and leading edge devices, and examined its behavior with external stores mounted beneath its wings. All three Skyrockets were retired from flight operations in 1956. At one point, Douglas considered developing a D-558-3 hypersonic research aircraft, upon request of the Office of Naval Research, but this aircraft remained a paper study. The D-558-1 and D-558-2 were of mixed aluminum and magnesium construction. Both types featured jettisonable nose sections to serve as emergency escape capsules and both were designed to carry heavy instrumentation payloads for flight research purposes. The first two D-558-1 Skystreaks were bright glossy red overall, but the D-558-1 #3 and later D-558-2 Skyrockets were glossy white, which proved more desirable for optical tracking purposes. The historic Douglas D558-2 #2, NACA 144, the first Mach 2 airplane, is in the collection of the National Air and Space Museum. White, US Navy, single-seat, rocket-powered supersonic aircraft.